Now, more than ever, the bulls have been called into question as a totem of Spanish identity, and yet here in English-speaking nations bewildered ignorance is not only still the norm, but has become something of a weapon in the hands of vested interests. I don’t deny for a second that both sides make things up. That was one of my great frustrations for as long as I could honestly describe myself as sitting on the fence on the issue (roughly until late 2011.) However, what I was always confused by was why those who are against los toros need to make things up in the first place. After all, everything is on display; there is no backstage in this theatre of death, and the blood is there for all to see. 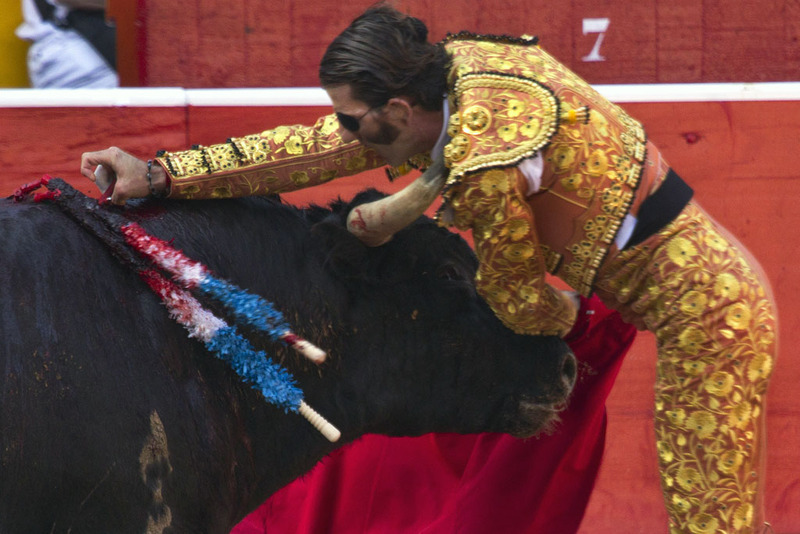 So, what is a ‘bullfight’? At the risk of sounding both evasive and pedantic, originally a bullfight was the setting of dogs onto a bull, a vicious blood-sport practised by the English which had its zenith under Queen Anne in the late 1600s. It was banned in Britain under the Cruelty to Animals Act of 1835, a bill sponsored by Society for the Prevention of Cruelty to Animals (it gained the Royal ‘R’ of RSPCA from Queen Victoria in 1840.) British bull-baiting is where the word “bullfight” comes from and where, interestingly, Britain’s national symbol comes from, the bulldog. Spain’s is the bull itself. This word has been co-opted to translate the Spanish word corrida, although it is not conceived of as a fight in Spain, and bullfight is also used to cover other activities, including novilladas and rejoneo. In all these events toreros, ‘those who play bulls’, work in teams, each team following their Maestro – and employer – who in the corrida is the matador, a word which means ‘killer’, pure and simple. Matador de toros bravos is a professional title, a license is issued for it by the Spanish government once a certain standard of competence has been achieved. 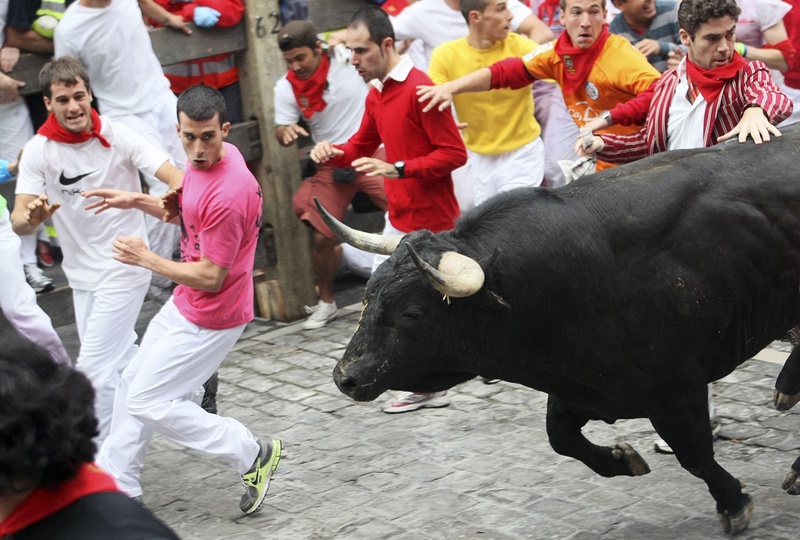 The full phrase corrida de toros actually translates best as ‘coursing of bulls’. Hence it is called la course des taureaux in France where it is also both popular and legal in the south, and developed from knights jousting bulls on light horse bred from the Arabian bloodlines introduced by the Moors when they conquered the Iberian Peninsula in 711 AD. However, when the French Bourbons replaced their Hapsburg cousins on the Spanish throne in 1700, they frowned on the pursuit, banning it more than once, and the nobles followed Royal example and withdrew from the ring with their horses, leaving the common man to take over on foot. In its modern incarnation the corrida is usually a two hour spectacle in which six bulls are danced with and dispatched in sequence, usually by three matadors facing two separate bulls each that evening. (Sometimes it is with only two matadors alternating in a mano-a-mano and occasionally with one matador as solo espada, ‘sole sword’, for all six bulls.) Each individual 20 minute lidia, ‘fight’, is divided into three acts. Those who regard it as a barbarism call this a blood-sport, while those who enjoy it call it an art, and neither camp use these terms as metaphors. I personally shy away from calling it a sport not because of ideological loyalties, but for the simple reason that no one who does it or watches it calls it a sport, nor is it written about in the sports’ section of the newspapers. No one keeps score in bullfighting and there is no way for anyone or anything to win. 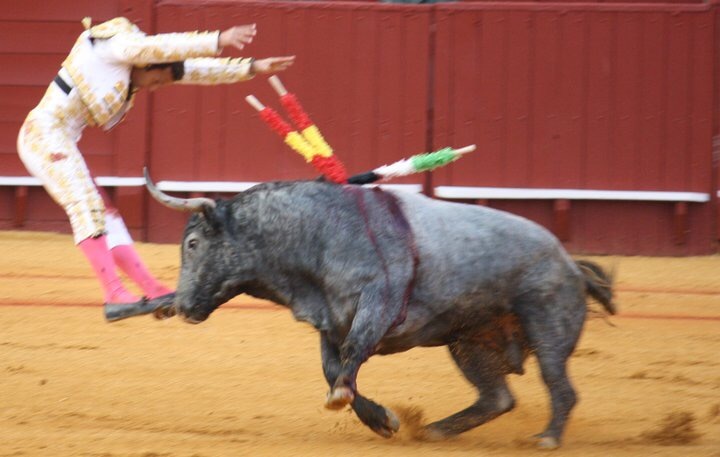 If the matador is incapacitated or killed by the bull another matador takes his place, and if all matadors at the plaza de toros that day are too injured to continue – as happened in Madrid last year which I discussed on LBC Radio – then the bulls are still killed anyway. 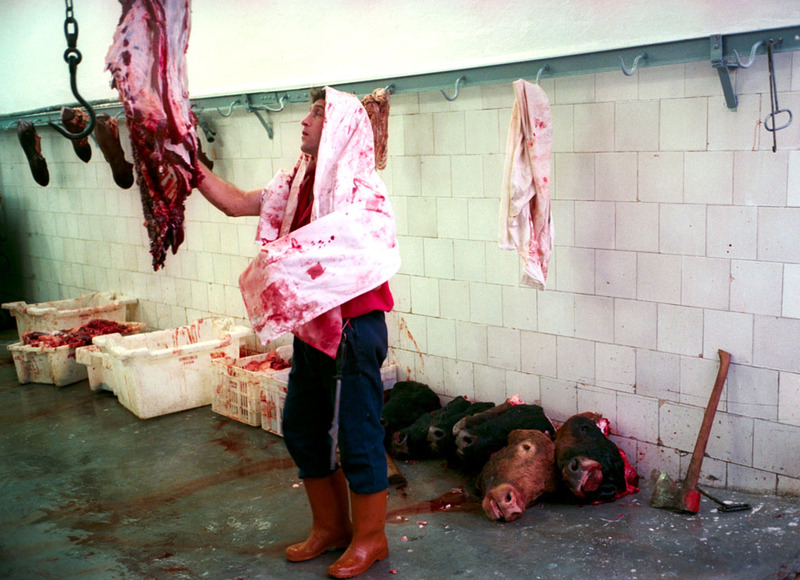 After all, their meat is pre-sold before entry to the ring, which is licensed as an abattoir under European law. Indeed, in many senses bullfighting grew out of the slaughterhouses, mataderos, of Seville, which was where the early toreros practised their craft. For this reason, the notion of fair play – a common cause of complaint among English-speaking audiences – has as little bearing here as it does in other theatres and the bull has as much chance as Hamlet or Macbeth of survival. It is no coincidence that one of the better books on the subject in English is Bull Fever by Kenneth Tynan, drama critic and founding literary manager for the National Theatre. Clearly not sporting then, but why artistic? Well, for starters it is called an art in Spain, and a clutch of matadors such as José Tomás have been given the Gold Medal of Merit in the Fine Arts by the Ministry of Culture alongside painters like Salvador Dalí, composers like Joaquín Rodrigo, filmmakers like Luis Buñuel, opera singers like José Carreras, ballet dancers like Tamara Rojo, actors like Antonio Banderas etc. No athletes or sportsmen are on this list. Stronger than that, though, is the argument of function. In common with all performance arts, success on the stage or the sand is defined by how much the audience has been emotionally moved. The morality or lack thereof is not what is at issue here: I’m not saying it is ethically justified by being an art. I’m just pointing out that to attack it for being ‘unsporting’ would be to commit a category error akin to talking about match-fixing in Shakespeare’s Macbeth. A young or talentless matador may receive only a few hundred Euros for an afternoon, out of which he must also pay his team of three banderillos, two picadors, his sword-page and his manager’s cut. In contrast, José Tomás commanded €1million for a single afternoon in Barcelona in 2009. Both are paid out of the box-office takings, and although the empresario of the ring negotiates the fee, he does so by predicting the public’s taste and setting prices accordingly: aficionados only open their wallets if they think their hearts will be moved. This emotional movement is not mere thrills either, otherwise novices would be paid more than veterans as they are more often in danger. The emotions a great matador engenders are infinitely more subtle than that. The risk of his death – and there is a risk, 536 famous professional bullfighters have died in the ring since 1700, 3 this year including the matador Victor Barrio in Spain (whose death I wrote about in The Sun, online here) – is like the music in a ballet, underlying and underpinning everything, but this is certainly not its sole essence. At least not any more. When the knights left the plazas, what art there was of the most primitive form. The corrida stood for Man’s struggle with Death, but also it was a man struggling with death – in that sense it is the most basic form of representation in that is a token of what it represents. Matadors were tough, brave and athletic, wearying out the bull at the end using the muleta, the famous red cloth, to distract it along with constant nimble footwork before killing it with the sword. The estocada, the kill with the estoque, the ‘rapier’, was the most important part. However, this changed in the 20th century, and this change is usually attributed to the innovations of the matador Juan Belmonte, born in the slums of Triana, Seville, in 1892. In order to avoid getting ahead of myself, it is worth explaining a little about the real foundation of the bullfight, though, which is the bull. The toro bravo is the male of a particular breed of domestic cattle. All domestic cattle are of the same species, Bos Taurus, as was their now extinct ancestor, the aurochs. These breeds vary almost as much as the breeds of dog, which is in turn the same species, Canis lupus, as its wild ancestor, the wolf. The relation between toro bravo and aurochs is most like that between German shepherd and Timber wolf: they are built along the same lines and have ready access to the same ferocity as their wild ancestor. In stark contrast, the most common variety of cattle in Britain and America, the Fresian-Holstein, is basically a box of meat/milk on legs and has had aggression and horns bred out of it to make handling it easier. That said, we still lose about a dozen people a year to cattle in the UK and ten times that number in the US. Toros bravos are born wild on estates composed of meadow and forest. These privately owned and box-office subsidised nature reserves. There are 1,341 registered and licensed estates and they comprise 1.2 million acres or 1% of Spain’s landmass – as Yellowstone is 1% of the US – and 17% of its natural landscape. All cattle from the farm end up in the food-chain, as with the rest of 1.3 billion-head global cattle herd. This food production result is why a small fraction of the European Union subsidy for farmers in Spain goes to these ranches, not to subsidise bullfighting as some disingenuous campaigners claim and the lazier sort of journalists repeat. However, much of the animal is no longer eaten by humans as we prefer the tender meat of far younger animals, so it becomes feed instead. On average the fighting bull lives in this idyll three times as long as the eighteen-month old meat-cow/bull at slaughter. It is ranched from horseback and only sees a man on the ground a few times in its life: when it is branded and the odd veterinary encounter. This means that when it enters the plaza it does not too quickly learn to distinguish the lure from the lurer. However, the downside of this is that it is very difficult to tell whether or not a bull will perform in the required manner when it enters the ring. Unlike, for example horse-racing – a similar size industry in Britain if you discount the gambling – there are many more characteristics required of a bull than simple speed and stamina. 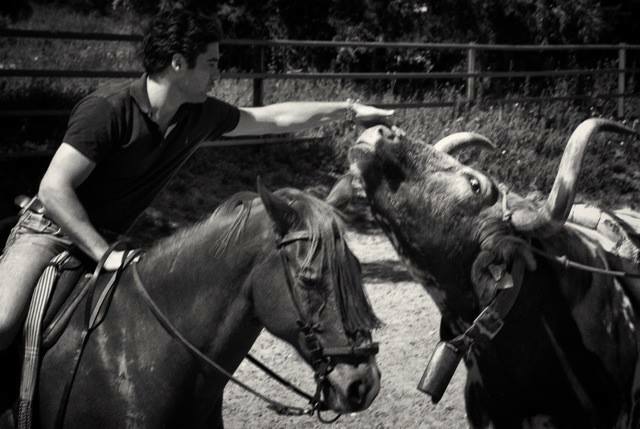 Due to this inbred and carefully nurtured ferality (no domesticated animal breed is wild in the biological sense) the bulls are maintained, herded and transported with extra care – even the fencing must be specially constructed – due to the risk to humans, horses and the bulls themselves which, if they are in anyway damaged on arrival at the ring will be rejected by the resident veterinarian. During the Franco era and immediately after, there were often accusations of the manipulation of bull-horns, particularly of shaving them, afeitado, the idea being that even a few inches off the length would make the bull less accurate. However, the inspection regime at bullrings nowadays, as with all things in Spain, is both more rigorous and transparent. The last scandal involving this was exposed in 1983 and resulted in fines of hundreds of thousands of Euros to those involved. As for accusations of doping, any sign of weakness or injury in the bull when he comes out of the gate is jeered and protested by the audience, and if this is upheld by the veterinary advisor who flanks the president of the ring along with a bullfighting advisor, the bull is replaced. A doped bull is an unreliable one, and reliability is the trait most prized by toreros. I’m not saying it hasn’t happened, but the idea of it being common is laughable: all one has to do is watch a few bullfights and one can see the animals are tranquiliser free. 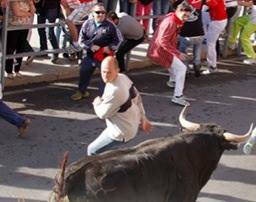 As for claims of rubbing Vaseline in their eyes: every toreros worst nightmare is a bull that does not respond to the movement of the cape but stumbles blindly around the ring goring everything and everyone in sight. The only way to survive this force of nature is to trick it using the evolved flaws in its perceptual and cognitive apparatus, not to remove them. Obviously, no one wants to incur the cost of replacing a bull, so practices that might lead to that are extremely rare now, and in fact the situation has been reversed. Once the representative of the bull-ring selects the bulls on the ranch for purchase, their horns are covered with plaster casts to prevent them from injuring and killing one another, as often happens in disputes over herd-dominance. Before selection, though, such disputes are of vital importance as this is how the animals build their battle-hardened musculature and learn how to use the great sabres of horn that spring from either side of their skulls. The bulls are transported in special trucks and unloaded into corrals with food and water at least a day before to allow them to adjust, before they are paired off – to even the differences, so, big with small, or long horn with short – and the matadors’ representatives draw lots for the pairs at noon on the day of the corrida. They are then put into individual but adjacent darkened chambers to rest them before the spectacle begins. The next time the bull sees the light is on his entry in the plaza, an environment as alien as any slaughterhouse, and at this moment he is at the height of powers which will only diminish across the next twenty minutes until his death. 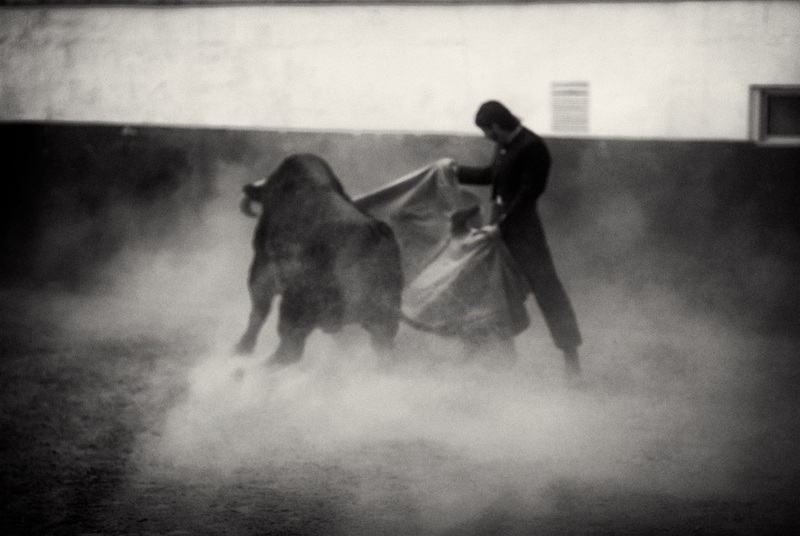 The first of the three acts of the lidia, ‘battle’ – to use an older Spanish word – is the most dangerous part of the corrida in terms of the bull’s unpredictability of response, its unregulated charges when it does respond, and its extraordinary energy. Some twist and turn mid-air like cats, others leap clean out of the ring into the callejón, the ‘alley’ divided from the circumference of the sand with a wooden barrier, forming a sheltered space where the toreros can prepare. On a couple of famous occasions bulls have even leapt into the audience itself, mounting hooves on the fence and propelling their half ton weight up and across a ten foot gap into the shocked crowd. The bull enters the ring by Jim Hollander / EPA. With this engine of fear and fury, the matador must engage. How much he engages at this stage is down to him, but he must at least walk out with the large capote, ‘cape’, which is distinctively pink on the outside and yellow on the inside, and is held in both hands. 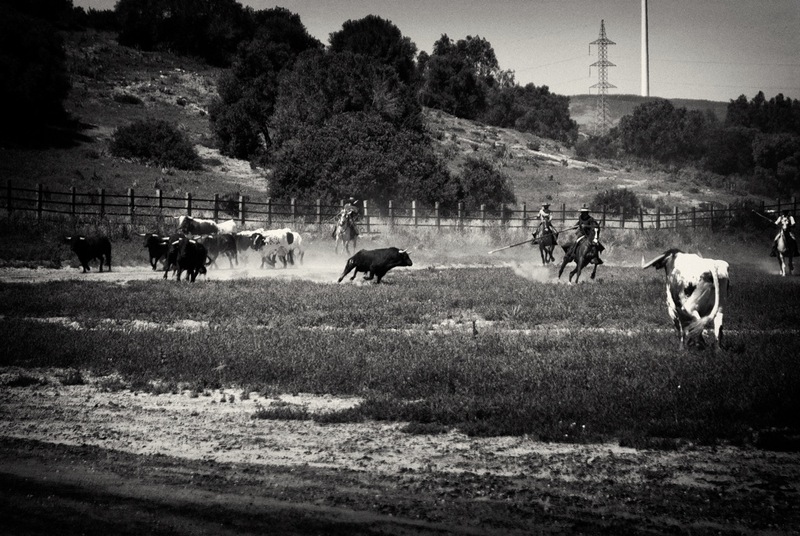 Here begins, or one hopes begins, the dance which is the actual essence of the modern corrida. 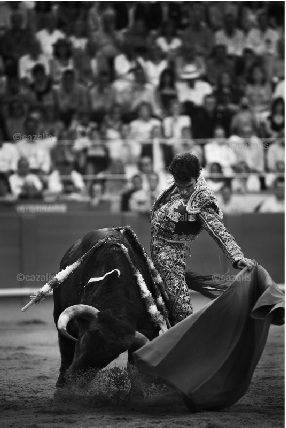 The matador begins by waving the cape at the bull, and as it charges, the matador’s task is to direct it into its folds which he brings past his body as he rotates at the waist. After the bull passes the man turns around and does the same again. During these exploratory passes the matador makes a decision. If the bull is too wild, tossing its head from side to side as it passes by the man’s body, and the man does not believe he can take control of the bull’s charge, or does not believe it worth the risk to attempt it – he is feeling off or tired or superstitious, or he does not like the small size or negative temperament of the audience – he will walk away and give up and the horses will enter the ring for the second scene of this act to begin. However, if he does not think that, then you will see the man change, and you will begin to see his toreo, the art and science of ‘bullfighting’, and his own development in the shadow Belmonte’s innovation, which that master summed up in three words: parar, templar y mandar, ‘stand, temper and send’. First the matador must ‘stand’ his ground, planting his feet into the sand and lock his knees rigid. The man does not move, the bull does. The central sculptural aesthetic he imposes on himself is defiance, no matter his inner turmoil. And this is not mere gesture, either. The training of the stance of the legs alone is measured in hundreds of hours in the studio, performing toreo de salón, under the watchful eyes of technical instructors and artistic managers, and watching his own and other matadors’ past performances over and over on film. The prior general waving of the cape refines into the hecho, the ‘make’. The cape, fifteen pounds of compressed raw silk, is held in finger tips and a flick sent down it so it snaps the base fabric in a way the angered bull is drawn to as surely as a tacked horse is pulled by its reins. With rigidly upright body, cape flowing out in front, the man makes the bull come to him at a gallop and then draws the cape past his body so the bulls horns’ never touch the cloth – lest it discover this is an empty appendage rather than an opponent – nor so far in front it sees the man’s legs and elects to change target. This is to ‘temper’ the charge. At this moment the central aesthetic concept is elegance and suavity of movement, playing counterpoint to the wild ferocity of the dance-partner. The bull is, anatomically and physiologically speaking, a short sprint animal. It is not a creature of distance and stamina, and after the matador sends it away, it must decelerate hard, turn, and then reaccelerate to killing pace. Usually within four or five of these ‘passes’, it will have slowed and clarified its charge, lost excess energy and become considered in movement. In visual effect, the deliberate and graceful matador is imposing these same virtues upon his dance-partner. This in Spanish is called dominación, although as much as anything, the way he lays the expanse of silk before the great darkness before him looks more like a courtier gesturing for his king to pass him by. These passes are also judged by their conformity to the set standards of the dance book of passes. The most basic of these is the verónica, named for the Saint who wiped the face of Christ with a cloth on his way to Golgotha. Toreo may have begun as the most primitive form of art with its primitively blurred collusion between artifice and reality, but it has grown up in the land of the most ritualised forms of Catholicism. It is no coincidence that good caping is built upon the sixth Station of the Cross. However, beyond the gladiatorialism and representative reality of man and beast, the exactitude of tradition and ritual, there is that which makes the perceiving soul, and the performing one as well, soar. In common with many toreros and aficionados, I believe the greatest matador on the sand today, and perhaps ever, is José Tomás Román. An elusive figure, José Tomás avoids interviews, the only one in reasonable depth being from ten years ago in El País and even then not by a journalist, but by the great flamenco singer Joaquín Sabina. Tomás has banned the broadcasting of his corridas on television since 2000 saying the spectacle only exists in the moment and space of its reality. He’s avoided the larger rings of Spain like Madrid and Seville not least due to their insistence on TV cameras and had not fought in Spain altogether from 2014 until 2016. I flew to see him then in Jerez de la Frontera, as did everyone from Bob Geldof to the former King, Juan Carlos (who eschewed the Royal Box in favour of a front row seat.) The face price of my ‘cheap’ seat high on the sunny side of the ring was €20 but I had had to spend €200 to buy it on resale since the box-office had sold out within hours of the announcement of his presence and front row seats in the shade changed hands for €2000. 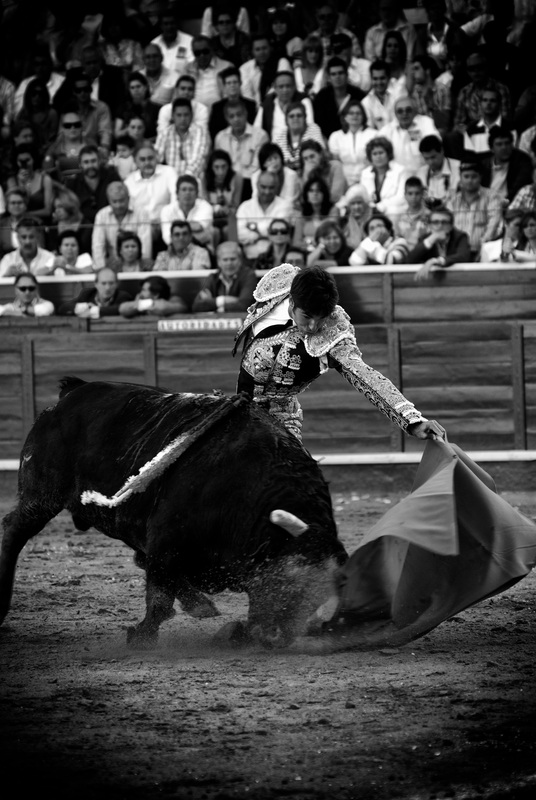 José Tomás has achieved something unique among matadors in the past half century, which is to marry the highest aesthetic ideals – to be a torero de arte – with the uncompromising approach to the possibility of injury and death of a torero de duros, a fighter of the ‘hard’ bulls from breeders like the legendary Miura. There have always been aesthetes among toreros who wait for a bull which charges as though mounted on rails, straight and true, and with which they can practise the most beautiful of body postures as the animal glides by – Morante de la Puebla is a current example – but they do not attempt this with more tricky individuals and avoid tricky breeds altogether. And there have been gladiators like Juan José Padilla whose still fights despite having had an eye removed along with a portion of his skull by a bull in 2011. Tomás, however, has no interest in proving himself with hard bulls and has focused on ‘smooth’ bulls from estates that produce straight charging animals. (These tend to be those owned by, or supplied by, the bloodlines of the Domecq family.) However, no estate can guarantee what sort of animal will come out of the gate, and despite this Tomás has fought each animal he is presented with insisting on his ideals of art with such vehemence that he either produced the striking beauty he seeks or he has been carried out of the ring bleeding. Early in his career it was as often the latter as the former. In 2010 he reached the zenith of this uncompromising approach when he came within a breath of dying in Aguascalientes in Mexico. The bull’s horn inflicted a wound with three separate trajectories into his body of 6 inches at the junction of leg and abdomen, breaching femoral, iliac and saphenous blood vessels, which the surgeons could not seal. They put 14 pints of blood into him – twice his body’s contents – calling the audience for transfusions when they ran out of stock. Once this work with the cape – all too brief when it happens, if it happens – is done then the trumpets sound and the horses enter the ring. Act One of the corrida is known in its entirety as the tercio de las varas, the ‘third of the lances’, and this second scene explains why. 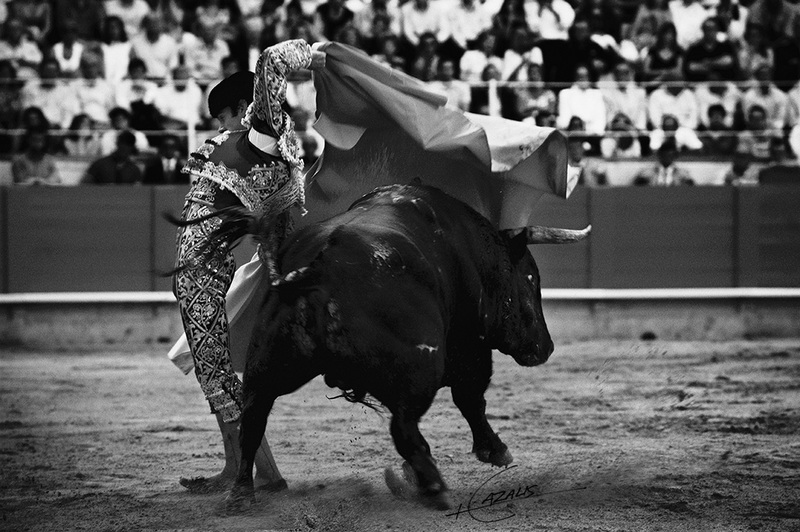 It is also the most controversial and least popular part of the corrida, even among Spanish audience members. The heavy horse is armoured with protective padding and ridden by a heavy man wearing leg armour and carrying a lance with a point which projects just less than three inches from a cross-bar. This is the picador. Around the sand of the plaza de toros are drawn two concentric circles, one within the other, their circumferences separated by two yards of sand. The bull is lured within the smaller circle, while the picador positions himself outside the larger one. Thus a minimum distance is established between the two stationary protagonists, and then the picador ‘cites’ the bull, invoking its charge, by waving the lance above his head, calling, and clanking his armoured boot within his steel bucket-stirrup. This is the link to the old corrida, the gladiatorial joust, and today allows the audience to see the power and fortitude of the bull, its ability to ‘take punishment’, to strive against the horse’s padding despite the lance-point being within him. This why the lance has a crossbar: to prevent the bull committing suicide on the spot. 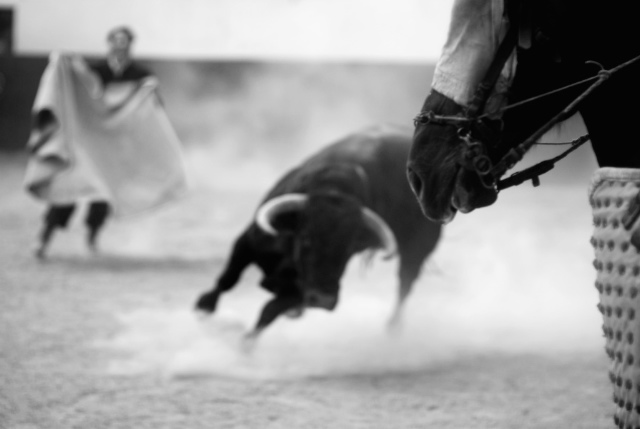 It demonstrates the bull’s bravura, and thus its worthiness to be in the corrida in much the same way the torero’s implacability earns him his place. I have seen corridas stopped by the president of the plaza and a group of steers sent in to herd a timid bull out so it can be replaced with a true toro bravo (needless to say the one herded out doesn’t get to return to the farm.) The Spanish word bravo with reference to toros comes far closer to its Latin etymological root rabidus, ‘rabid’, than the English sister-word ‘brave’. This is because in that first bullfight Hemingway saw – on May 27th, 1923, in Madrid – the horses on which the picador rode would have been either mortally wounded or outright killed by the bull. The plaza functioned as both abattoir for cattle and knacker’s yard for horses at the end of their useful lives. By the mid-1920s this had begun to become an embarrassment to the upper echelons of Spanish society, especially when accompanied by foreign visitors. Although not faultless, especially in the early days, I have ridden and studied horses for thirty years and in the thousands of ‘actions’ by picadors I have witnessed in plazas around the world in person and on film I have not only never seen a horse killed, but have never even seen one leave the ring lame. This compares with the seven horses who died across the four days of horseracing racing at the Cheltenham Festival in the UK in March this year or the 24 horses The New York Times say die every week on racetracks across the US. After a minimum of two pics in a first class plaza or one elsewhere, the president lays out a white handkerchief on his balcony, the trumpets sound – the signal for a change of act – and the picadors leave the ring. We now enter Act Two, when the entire pedestrian cast comes on stage. However, the great expenditure in energy in trying to lift heavy cavalry is what has really taken its toll. That and the inefficacy of all tactics it has deployed to this moment. At an instinctive level, where conditioned reflex has led to a null result, the bull is confounded. In Spanish its deportment is described as having changed from levantado – elevated, full of power – to parado – stopped. Now enter the banderilleros, those who places the banderillas – the ‘little flags’ – which are two foot long sticks covered in coloured paper with inch long steel barbs on the end. Sometimes the matador performs as his own banderillero – notably David Fandila ‘El Fandi’, Vicente Barrera and the one-eyed Juan José Padilla do this regularly – and historically matadors did so more often than today when dynamic movement rather than static defiance were central to the spectacle. It is immensely popular in smaller, more rural bullrings, and is definitely a thrill to perceive rather than a beauty. The purpose within the development of the lidia of this middle act can be best explained in terms of audience and bull together. The banderillero incites the bull to charge at him by leaping up and down on the spot, arms above his head. In doing this he resembles in silhouette a bull tossing its head in challenge in the distance. Then he begins to run in a manner dictated by how the bull runs in answer. The intent here, as with the cape, is to conform to a shape, but here the shape is the path run by both protagonists. 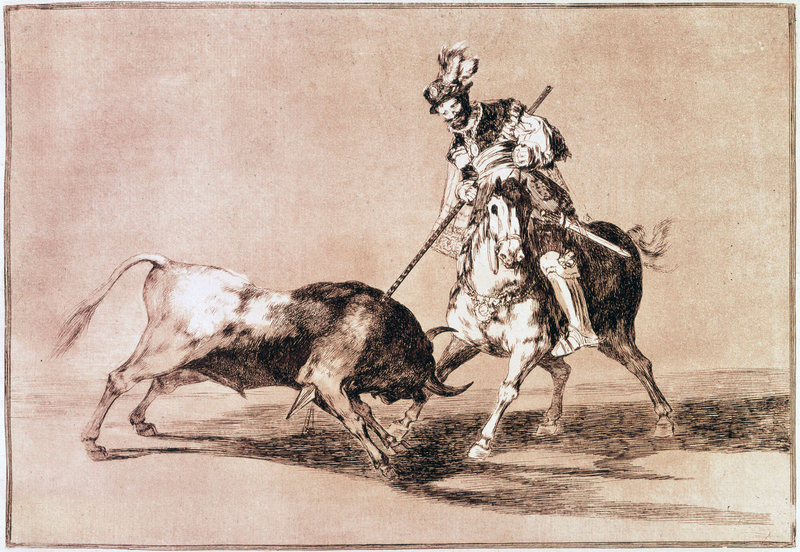 At one point on this path – be it head on, poder a poder, or two approaching curves which sketch a bull’s horn in the sand, al quiebro, or the other variants – the torero and toro intersect, and the man thrusts the banderillas’ points into the heavy hide over the bull’s withers, before exiting this moment of danger. Failures at this moment of intersect have huge risks. 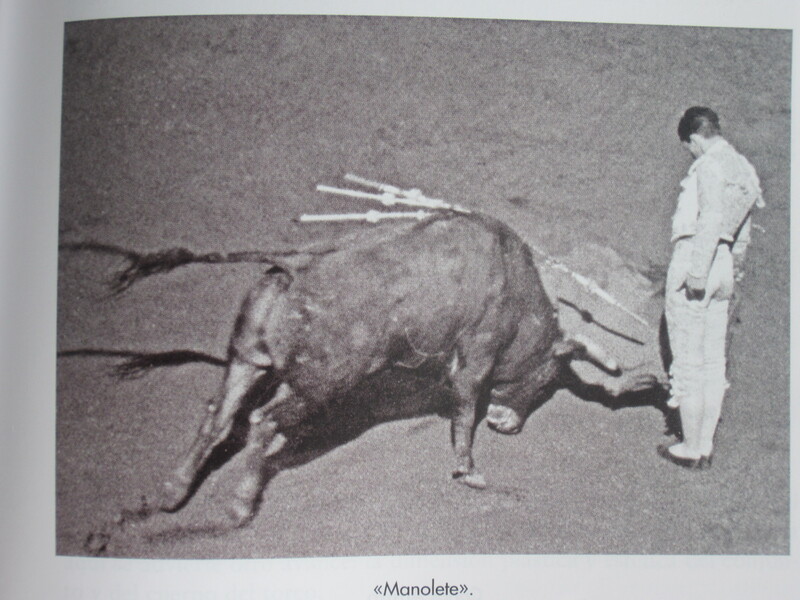 The penultimate torero to die on Spanish soil was a banderillero, Manolo Montelui in 1994 in Seville. His “heart was opened like a book” according to the medical report, a grim phrase that also speaks to what the risks to toreros actually are. With a minimum of three surgeons, including general, trauma/vascular and plastic in the bullrings of the first category, dying requires a straight shot to heart or brain since you are under the knife within a minute. Whereas the 20-year-old novillero, Renatto Motta, who died in May, bled to death during the two hour journey on the road from the plaza de toros of Malco in the Andes to the nearest decent hospital in Nazca. This was not always the case. It was these during these movements between hospitals that so many matadors died last century in Spain. That, and from post-injury infection, hence a bust of Alexander Fleming, discoverer of penicillin, stands outside Spain’s largest bullring – the 24,000 seat Las Ventas in Madrid – with a statue of a matador bowing before it. Movement and risk are central to the tercio de banderillas. It is an athletic pursuit requiring timing on the hoof. It wakes up the audience, the toreros and the toro, as, no doubt, does the fact that the bull comes off each of the three encounters with a pair of mini-harpoons in its shoulders. Here one must revisit concept of injury and death of an animal for entertainment, in no matter how high or low brow a sense of the word entertainment. It requires an almost inhumanly, and some would say inhumanely, open mind to shift one’s perspective if one was born and raised outside Spain to accept this. Unless, that is, one simultaneously bears fully in mind the fact that we slaughter calves for meat we genuinely don’t need to eat, and do so on the whim of taste. Beef is nutritionally unnecessary, medically dangerous, environmentally damaging and financially punitive. Why do we eat it? For the entertainment of our palates: we eat meat because we like the flavour, pure and simple. Now we come to the final and most famous act, the ‘third of death’, when the matador enters alone with the muleta, the famous red cloth attached to an internal wooden stick and a sword. The muleta is a one-handed instrument which may be used in either left or right, whereas the sword must remain in the right. This means that when the muleta is used in the right hand the sword blade is placed in its folds, extending the fabric area to make a considerably larger lure. On the left, the muleta is held only by its internal stick and thus is a smaller distraction and so more dangerous for the matador. Before Belmonte, the matador made the bull charge with a combination of muleta and his own athleticism, he knees bent and posture crooked like an athlete, ready to get out of the way, his team around him ready to take the bull away. It resembles nothing of what one sees today in the ring, but more closely resembles what you see in the streets when running with bulls. The change came with Juan Belmonte in 1913. It is often said that Belmonte changed the nature of bullfighting because he was not physically adequate to the athletic task of moving out of the way of the bull and so developed a technique by which he moved the bull instead. Whatever the truth of this theory as a point of origin, there is no denying the static pose and cámara lente, ‘slow motion’ movement which dominates the modern art of toreo owes itself to a single technical accomplishment. 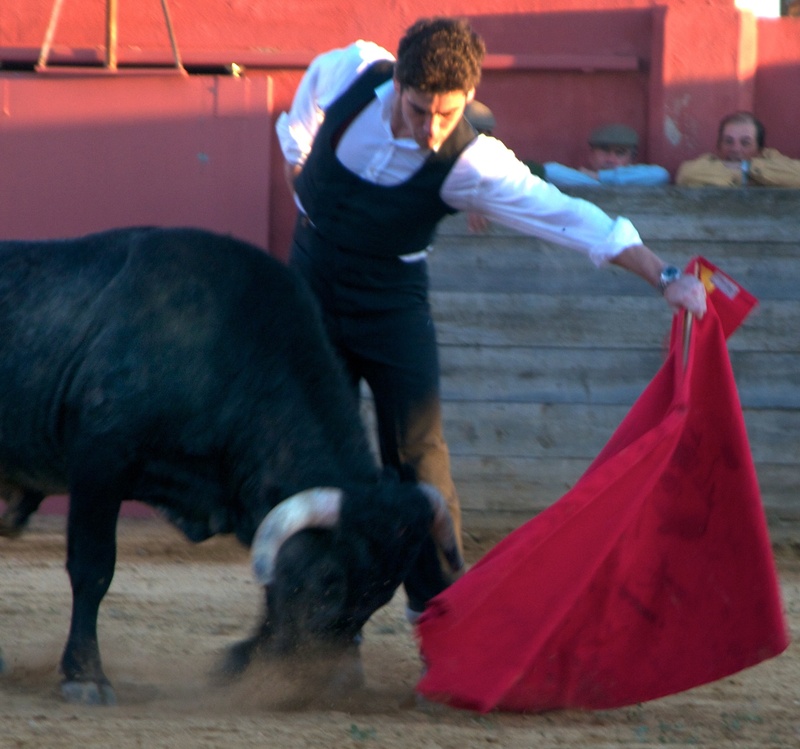 Belmonte stood still and close to the bull so as to place the muleta in its face as that was the only way to make the cloth its sole focus as it charged. He not only thus hid himself from the animal but also gained greater control of its direction as he could determine where within the cloth it was focusing its charge. This led to a further innovation: with the bull thus transfixed, the lowering of the man’s hand leads to the lowering of the animal’s head. 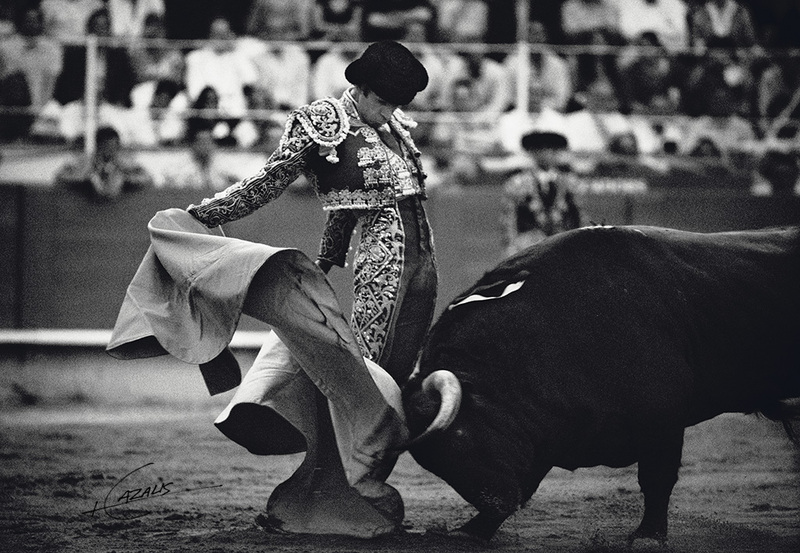 The primary effect of this is the bull must slow down, giving the torero a control he formerly lacked, as well as looking extraordinary to eyes that had never seen this before. Furthermore, on a purely aesthetic level, the bull must arch its neck, making it resemble a horse in dressage, while also creating the body-shape a bull assumes before tossing an opponent. It thus looks simultaneously more controlled and more dangerous, which is a visual conflict, and conflict is the essence of drama. The era in which those two shared the rings of Spain began in 1913 and is called the Golden Age of Bullfighting. It ended in 1920 when against all expectation and augury the classical athlete Joselito was killed by a bull. Belmonte, on the other hand, died by his own volition – suicide by gunshot like his friend Hemingway the year before – not that of a bull in 1962, a week before his 70th birthday. It is hard to overemphasise how revolutionary this change was. 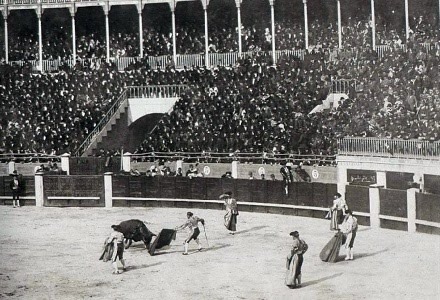 In its absence, the corrida would not have survived the transition to modern Spain as it is the root of all that is visually beautiful in bullfighting and what facilitated its evolution from crude blood-sport to refined blood-art, and allowed the educated elites to defy progressive pressure groups with their claims of barbarism and anachronism. In short, the politicos could say it was Art and believe it. Of course, Belmonte had forerunners in his style – Antonio Montes is the most often mentioned – and there were revolutionaries afterwards. Who it was who began to ligar – ‘to link’, ‘to sew’ – the passes I do not know, but this led to the evolution from ‘the statue and the storm’ (as I titled my paper for Seville’s Foundation Of Taurine Studies) to ‘the dancer in the storm’. It is often said to be the great Manuel Roriguez, ‘Manolete’, a towering figure in toreo from his elevation to matador in 1939 until his death on the horns of the Miura bull in 1947. Famed for his solemnity and stillness, Manolete became so internationally famous they had to build the largest bullring on Earth, the 41,000-seat plaza de toros of Mexico City, to house his fans. Where Belmonte faced his cattle three-quarter on, feet apart, Manolete’s stance was in profile, feet together. This makes you less of a target than the cloth but yields a shorter pass as the change of weight from one leg to the other does not move the shoulders as far. However, if you fix the bull into the outside edge of the muleta, you can create a turning arc the bull can complete with less of a pause, allowing a link between one pass and the next, generating a series. This sustains the emotion of the crowd as they view the sculptures of man and animal, moulded by the matador’s mind, and allows it to build, hence the rising chants of olé at each pass, until the crowd are brought to their feet and their cheers torn from the throats by the perfect end of a tanda, ‘series’. It can be no coincidence that the linking of separated moments of beauty to generate a moving dance has gone hand in hand with the advent of moving pictures in the ring. Manolete was the first movie-star matador in the Hispanic world. 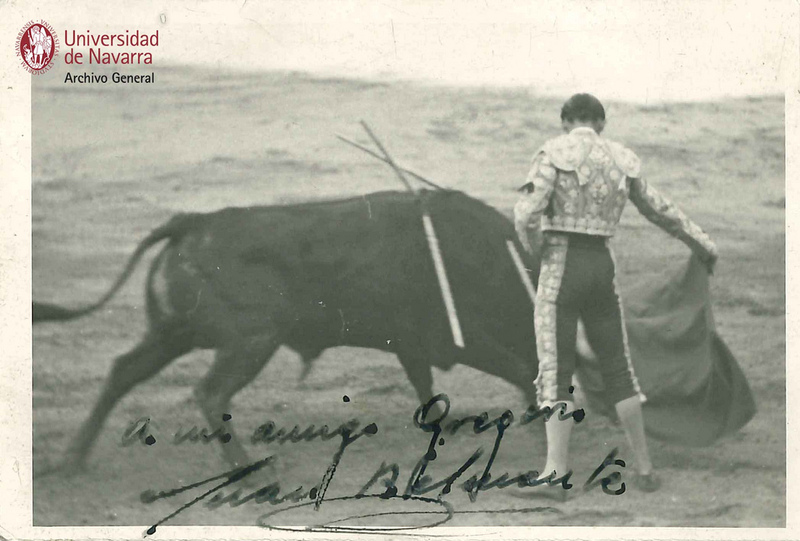 So it is an irony that José Tomás, the matador who took this great stylistic innovator and purified his manner in the ring – as the picture shows, it is the same pass as Manolete’s, but with an improved line of body and the bull’s horns closer to the leg although it is fixed in the same place within the muleta – went on to ban filming of his corridas, saying true purity lay in the emotions generated for the audience in the ring, not at home on their sofas. Of course, in the time of Manolete television did not exist in Spain – it was not launched until almost ten years after his death – and so his performances would have been watched on the giant screen of the cinema sitting among a crowd of aficionados as in the plaza de toros. Of the kill itself, although it has become less important relative to the other acts in the ring, it is still a prerequisite, a sine qua non, of a triumph in the ring: to kill badly is to fail. 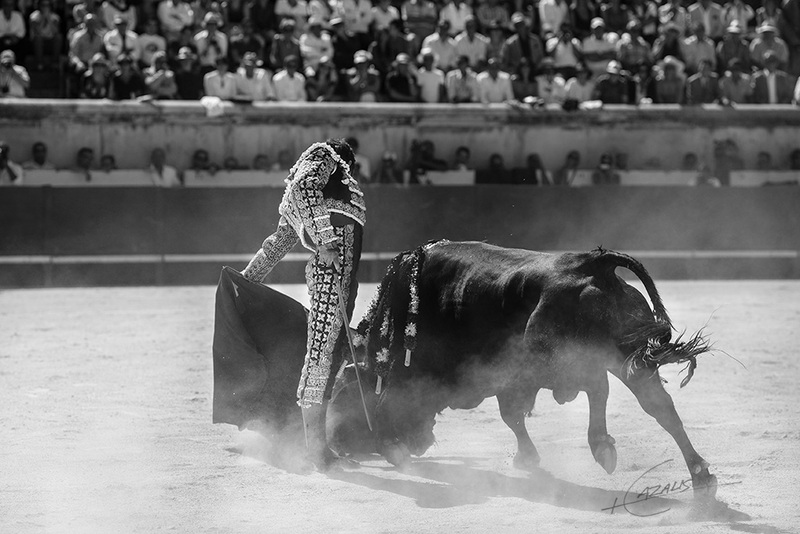 And it is in this moment, the sole moment when the matador charges the bull, entering with the sword volapié, with ‘flying feet’, over the horns and thus exposing his body to them, hence its name: el momento de verdad, ‘the moment of truth’. The matador lines up the bull with the muleta in his left hand trying to bring the front hooves together to part the shoulders more. He aims the sword point in his right hand, and leaps, trying to find a tiny letter box of a gap between the fourth and fifth, or fifth and sixth ribs, spine on the right, scapula on the left, all made of bone as impenetrable as concrete. So that is the bullfight: a scripted drama, whose medium is a dance between the monument to the deliberate, the man, and the incarnation of wildness, the bull, framed in gold and artifice, but whose peroration is a synthesis of the mannered and the real, the ritual sacrifice. Any man can face death, but to bring it as close as possible while performing certain classic movements and do this again and again and again and then deal it out yourself with a sword to an animal weighing half a ton which you love is more complicated than just facing death. It is facing your performance as a creative artist each day and your necessity to function as a skilful killer. 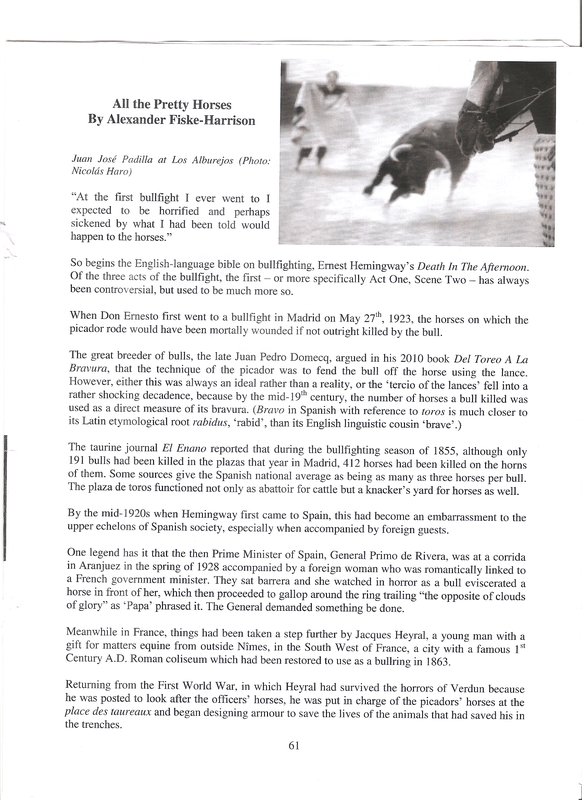 So begins the English-language bible on bullfighting, Ernest Hemingway’s Death In The Afternoon. Of the three acts of the bullfight, the first – or more specifically Act One, Scene Two – has always been controversial, but used to be much more so. When Don Ernesto first went to a bullfight in Madrid on May 27th, 1923, the horses on which the picador rode would have been mortally wounded if not outright killed by the bull. The taurine journal El Enano reported that during the bullfighting season of 1855, although only 191 bulls had been killed in the plazas that year in Madrid, 412 horses had been killed on the horns of them. 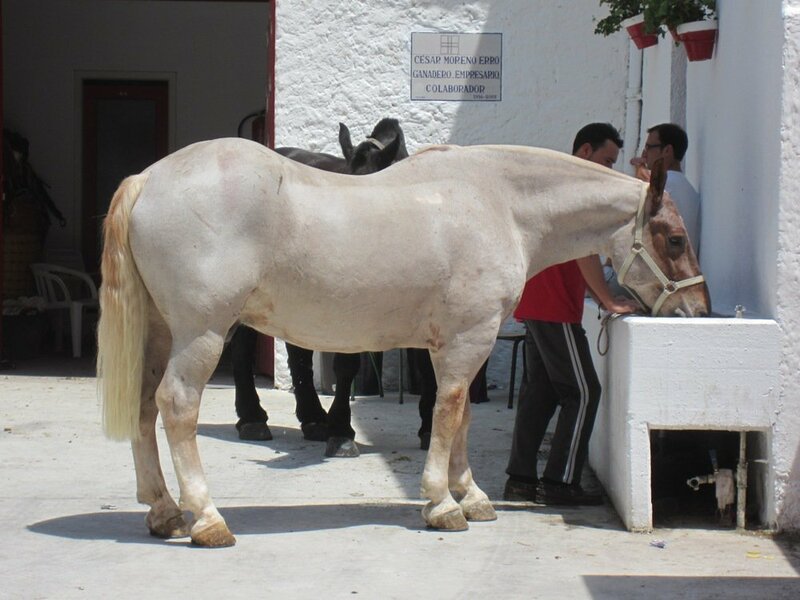 Some sources give the Spanish national average as being as many as three horses per bull. The plaza de toros functioned not only as abattoir for cattle but a knacker’s yard for horses as well. By the mid-1920s when Hemingway first came to Spain, this had become an embarrassment to the upper echelons of Spanish society, especially when accompanied by foreign guests. One legend has it that the then Prime Minister of Spain, General Primo de Rivera, was at a corrida in Aranjuez in the spring of 1928 accompanied by a foreign woman who was romantically linked to a French government minister. They sat barrera and she watched in horror as a bull eviscerated a horse in front of her, which then proceeded to gallop around the ring trailing “the opposite of clouds of glory” as ‘Papa’ phrased it. The General demanded something be done. Meanwhile in France, things had been taken a step further by Jacques Heyral, a young man with a gift for matters equine from outside Nîmes, in the South West of France, a city with a famous 1st Century A.D. Roman coliseum which had been restored to use as a bullring in 1863. Returning from the First World War, in which Heyral had survived the horrors of Verdun because he was posted to look after the officers’ horses, he was put in charge of the picadors’ horses at the place des taureaux and began designing armour to save the lives of the animals who had saved his in the trenches. By 1927 Heyral had a functioning leather caparison, an equine coverlet, which became standard in France and thus well-known to the Spanish picadors who came with their matadors to the major bullrings of Southern France. This was not necessarily out of kindness, by the way. The daily task of a picador in Spain up until then was to try to dismount from a dying horse without being thrown or being pinned beneath it. And even then they were left standing in heavy leg armour with no cape in front of a bull. Anything that changed this state of affairs would have been popular to say the least. For this reason the greatest breeder of Spanish bulls of the time, the 14th Duke of Veragua – the 1st Duke was Christopher Columbus’s grandson –requested that a caparison be sent to his ranch Los Alburejos near Jerez de la Frontera, a ranch that now belongs to Álvaro Domecq where he breeds the Torrestrella bulls. There he showed it to General Primo de Rivera in a tíenta in the spring of 1928, and by that summer its use was made law by Royal decree. In Spanish it was called the peto, or ‘bib’, since the prototype covered mostly the chest. Does the modern peto work? Although not faultless, especially in the early days, having ridden and studied horses for thirty years, and seen the thousands of ‘actions’ by picadors in person and on film, this author has not only never seen a horse killed, but has never even seen one leave the ring lame. 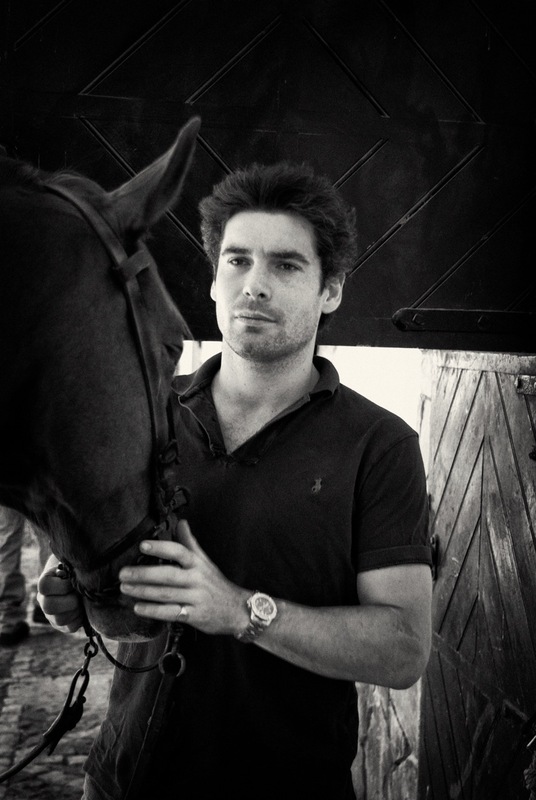 And if you go to Nîmes, you can see Jacques Heyral’s grandson Philippe in the callejón, where he runs the patio de caballos today, still looking after the horses that saved his young grandfather’s life and are the reason he is alive today. Alexander Fiske-Harrison’s short story ‘Les Invincibles’, set in Paris in 1958 and Pamplona in 1959, was a finalist for Le Prix Hemingway, awarded in Nîmes in May, and will be published as part of Uriel: Et autres nouvelles du Prix Hemingway 2016 by Au Diable Vauvert this September. 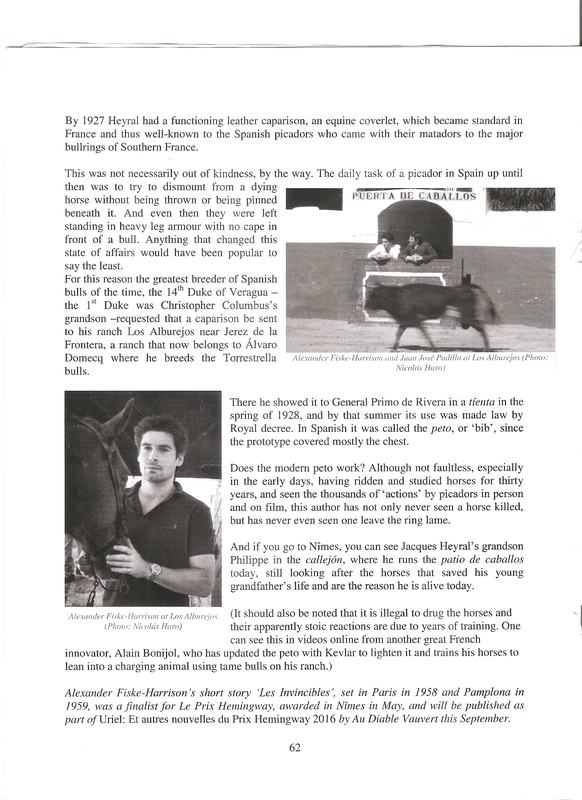 It is available in the original English at The Pamplona Post online here. 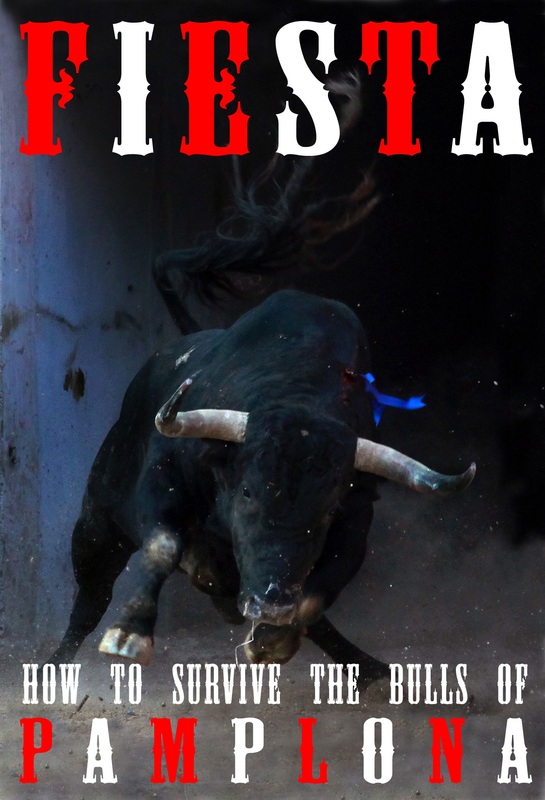 This entry was posted in Animal Ethics, Animal Science, Books, Bull-running, Bullfighting, Cayetano Rivera Ordóñez, Cuéllar, Eduardo Dávila Miura, Ernest Hemingway, Jerez de la Frontera, José Tomás, Journalism, Juan José Padilla, Miura, Morante de la Puebla, Orson Welles, Pamplona, Seville, Spain and tagged Abattoir, Alexander, alvaro domecq, animal rights, animal welfare, annual, antonio miura, Antonio Ordóñez, armour, art, banderillas, banderillero, Barnaby Conrad, beauty, belmonte, borbons, bourbons, breed, bull, bull fever, bull-baiting, bull-fight, bull-fighter, bull-fighting, bull-run, bull-runner, bull-running, bull-runs, bullfight, bullfighter, bullfighting, bullrun, bullrunner, bullrunning, bulls, capote, carlos cazalis, castile y leon, castille, castille and leon, Cayetano Rivera, cornada, corrida, cuellar, dance, dangerous summer, david fandila, de los reyes, death, death in the afternoon, death of manolete, dogs, domecq, duke of veragua, eduardo davila, el cid, el fandi, el gallo, encaste, encierro, encyclopaedia, encyclopedia, ernest hemingway, espada, estocada, estoque, falces, feria, Fiesta, figures, Fisk-Hamilton, fisk-harrison, Fiske-Harrison, fitz-hamilton, fitz-harrison, Fran Rivera, francisco rivera, frascuelo, giles coren, gored, goya, guerrita, hapsburgs, herida, horses, injury, into the arena, jerez, jose tomas, Joselito, juan belmonte, Juan José Padilla, Julen Madina, Kenneth Tynan, killed, lamborghini, league against cruel sports, los alburejos, Madrid, manolete, manuel rodriguez, mark rowlands, matador, ministry of culture, miura, moors, morante de la puebla, moreno de la cova, muleta, mundillo, mundo de los toros, mundo de toros, mundo taurino, navarra, navarre, nicolas haro, novillero, novillo, old castille, ordonez, pamplona, passes, PETA, peto, picador, profile books, queen anne, rentatto motta, rspca, saltillo, san sebastian, sangre de reyes, sanse, seville, Slaughterhouse, Spain, spca, statistics, sun also rises, sword, tauromachy, tauromaquia, toreo, torero, toros, toros bravos, torrestrella, vicente ferrera, victor barrio, world of the bulls, World Of The Spanish, xander, zander by fiskeharrison. Bookmark the permalink. 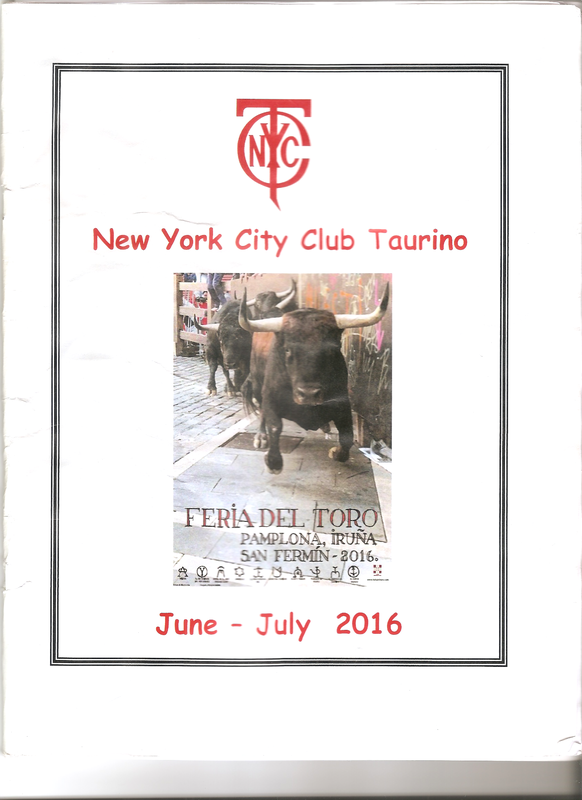 I have been pushed into aficionado by trips that had “ports of call” coinciding with bull fights. I wanted a bull fight poster and have accomplished such.